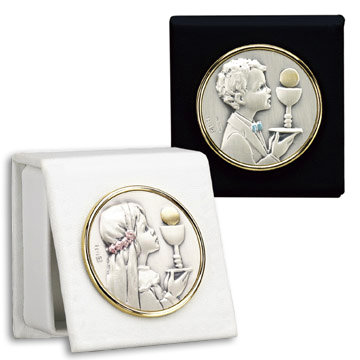 These rosary boxes in rich Italian leatherette features the Salerni sterling silver First Communion medallions. Each book shaped box opens to store rosaries, pins or other keepsakes. Gift boxed. All items are F.O.B. factory. Prices are subject to revision without notice, please contact us to confirm current price.